These criminals are thought to be great leaders and saints, in fact they are conspiring together against humanity. 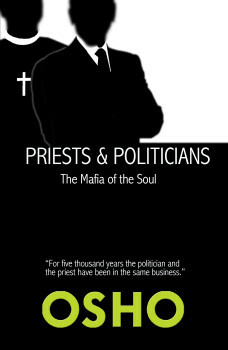 The politician rules the outside and the priest rules the inside, supporting each other in their attempt to dominate humanity. In a climate where many people are not happy with their personal life, social environment and politics, it is easy to project this anger-energy without reflection and without understanding where the roots of the problems really are. In this new edition and provocative volume, Osho challenges us to look through his microscope and examine not only the profound influence of religion and politics in society, but also its influence in our inner world. To the extent we have internalized and adopted as our own the values and belief systems of the “powers that be,” he says, we have boxed ourselves in, imprisoned ourselves, and tragically crippled our vision of what is possible. A new kind of world is possible — but only if we understand clearly how the old has functioned up to now. And, based on that understanding, take the responsibility and the courage to become a new kind of human being. From Occupy Wall Street to the Arab Spring, from the election of the first Black president in the US to a new pope who promises to use St. Francis of Assisi as a role model (following endless scandals involving child abuse) the roles of priests and politicians in our public life have recently captured the attention of our times, often just initiating another round of hope and subsequent disillusionment. In other words, wittingly or unwittingly, we keep digging ourselves deeper into the mess we are in.